^ "English: Marquis". Collins Dictionary. n.d. Retrieved 22 September 2014. ^ "French: Marquis". Collins Dictionary. n.d. Retrieved 22 September 2014. ^ "Marquess and Marchioness". Debrett's. n.d. Archived from the original on 10 November 2014. Retrieved 22 September 2014. ^ "Marchioness". Collins Dictionary. n.d. Retrieved 22 September 2014. ^ Lebra, Takie Sugiyama (1993). Above the Clouds: Status Culture of the Modern Japanese Nobility. CA, USA: University of California Press. p. 51. ISBN 9780520911796. 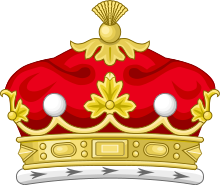 The Chronological Peerage of England, hereditarytitles.com as of 2 March 2003; ; omits Normanby, misspells Hartington as Martington, places Marquess of Lorn and Kintyre in the peerage of England (Scotland is more probable). Chisholm, Hugh, ed. (1911). "Buckingham and Normanby, John Sheffield, 1st Duke of" . Encyclopædia Britannica. 4 (11th ed.). Cambridge University Press. pp. 727–728. — "and in 1694 was made marquess of Normanby"